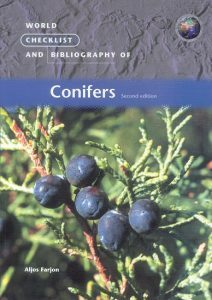 This checklist of conifers, the third in a series covering a selection of vascular plant families, includes all species and infraspecific taxa recognized by the compiler in 68 genera and 8 families. In total 805 taxa are alphabetically arranged and synonyms are extensively listed at all ranks. Details of distribution, growth form and IUCN status are given, as well as standard references to important taxonomically related literature for families and genera. The text is enhanced by 30 superb illustrations, many drawn by the compiler.